It is also possible to use Gradle or run an executable Jar file instead but I will be using Maven for the following examples. With the Maven plugin we’re able to run the following operations for our project.. The following command scans our project for different structures (classes, relations, dependencies, artifacts etc.) and is enhanced by different plugins adding additional information to the structure database e.g. by adding labels. This creates complete databases and indexes in the directory target/jqassistant/store. Increasing memory may be controlled with the following environment variables ..
We may enforce architectural constraints by defining rules with Cypher queries embedded in XML or AsciiDoc. As jqAssistant is capable of reading rules from AsciiDoc, we may use it as a tool for living documentation – there is a nice example available for this, the “jqAssistant Spring Pet Clinic Demo Output“. 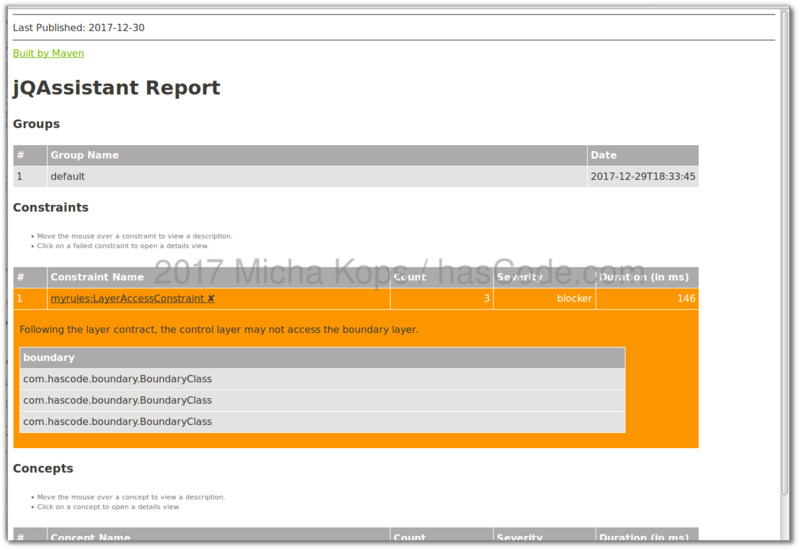 We’re now writing a sample constraint that forbids classes in the package com.hascode.control to access classes in the package com.hascode.boundary (assuming some layer contract). We’re writing this constraint in AsciiDoc in a file named myrules.adoc in a directory named jqassistant in our project directory. this constraint is defined by our following cypher query .. if the query returns something, it fails..
.A collection of architectural constraints. .Following the layer contract, the control layer may not access the boundary layer. WHERE control.fqn STARTS WITH "com.hascode.control"
AND boundary.fqn STARTS WITH "com.hascode.boundary"
A detailed explanation of the rules syntax can be found in the jqAssistant manual here. This is the directory structure of our sample project where the constraint above is violated because ControlClass from the control layer accesses BoundaryClass from the boundary layer. [INFO] Executing analysis for 'jqassistant-tutorial'. [INFO] Validating constraint 'myrules:LayerAccessConstraint' with severity: 'BLOCKER'. [ERROR] Following the layer contract, the control layer may not access the boundary layer. As expected, our build fails and reports an error because our constraint was violated. The following Bitbucket Pipeline Build demonstrates this result, too. [INFO] Available rules for 'jqassistant-tutorial'. [INFO]   "cdi:BeansMustNotUseFieldInjection" - CDI beans shall not use field injection (constructor and setter injections are fine.). [INFO]   "cdi:BeansMustUseConstructorInjection" - All CDI beans must use constructor injection. [INFO]   "dependency:ArtifactCycles" - There must be no cyclic artifact dependencies. [INFO]   "dependency:PackageCycles" - There must be no cyclic package dependencies. [INFO]   "jpa2:ValidationModeMustBeExplicitlySpecified" - The validation mode of all persistence units must be explicitly specified and either set to CALLBACK or NONE. [INFO]   "junit4:AssertionMustProvideMessage" - All assertions must provide a message. [INFO]   "junit4:IgnoreWithoutMessage" - All @Ignore annotations must provide a message. [INFO]   "junit4:TestMethodWithoutAssertion" - All test methods must perform assertions (within a call hierarchy of max. 3 steps). parent of the module (i.e. to keep the project hierarchy consistent). [INFO]   "myrules:LayerAccessConstraint" - Following the layer constract, the control layer may not access the boundary layer. [INFO]   "osgi-bundle:InternalTypeMustNotBePublic" - Internal types must not be public if no depending types exist in other packages of the bundle. This command should enlist our custom groups and constraints, too! 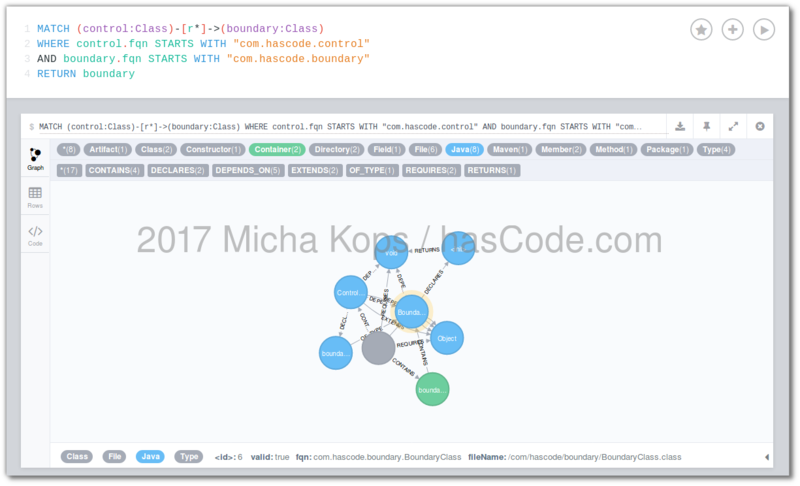 I have added an example for exploring existing structures with the Neo4j browser at the end of this tutorial, please feel free to skip to this section. The following queries are helpful to explore our architecture and code structures, examples for exploring a concrete system step by step can be found at the end of this tutorial here. The following query shows existing labels. When exploring our project sources, nodes labeled with Class, Type are often a good entry point for analyzing relations or aggregating code metrics. This query allows us to explore existing relation types for labeled nodes .. in this example we’re fetching all relation types for nodes labeled as Class. Showing a combination of labels and relationship types. The following queries shows existing indexes and constraints. This might be only relevant when we need to rewrite a query for performance. This query explores properties for nodes of a given label – in this example for nodes labeled with Type. Having explored our code structures and components we may now analyze weak points, code smells and possible hot-spots for refactoring. There are plenty of possible metrics, some well-known basic ones like this (an explanation of these metrics can be found here). The following single queries may be combined to aggregate new code or quality metrics. This query allows us to explore a given package and fetch classes with a high number of methods (possible code smell). The deeper a classes inheritance level, the harder it is to predict its behavior because of the inherited methods, deeper trees involve greater design complexity (Chidamber, S. R. & Kemerer, C. F). Therefore the following query shows us the classes with the deepest inheritance hierarchy in a given package. WHERE class.fqn STARTS WITH "com.hascode"
This query returns the amount of relation between classes in a given package. This query fetches the ratio of own and foreign classes. WHERE c.fqn STARTS WITH "com.hascode." AND NOT o.fqn STARTS WITH "com.hascode." WHERE c.fqn STARTS WITH "com.hascode"
Returns a list of the classes with many constructors..
Too many parameters for a method might be a code smell.. Same as above but now only for constructors..
Finds service implementations using the service-loader mechanism. Might be useful to scan if important SPIs are implemented. This query counts non-abstract types in a package. This may be used for other queries e.g. to calculate the abstractness of a component. WHERE t.fqn STARTS WITH "com.hascode"
This query counts abstract types in a package. This may be used for other queries e.g. to calculate the abstractness of a component. For validating architectural constraints there is another library that might be of interest: ArchUnit. I have written a short how-to/tutorial about this library here: “Assuring Architectural Rules with ArchUnit“. A possible option to explore a system is to start at a well-known class and dig through its dependencies, fields and references. WHERE n.fqn ENDS WITH "DslProcessorImpl"
As expected we see a single class – an in addition to that we can see the additional labels that the selected node possesses: Class, File, Java and Type. We see a lot of additional nodes as well as a list of named relations like CONTAINS, DEPENDS_ON, DECLARES and many others. With this information we may create additional queries to analyze the system. WHERE c.fqn ENDS WITH "DslProcessorImpl"
Switching between the graph view and the table view is helpful depending on the output of our queries in the Neo4j browser. These queries are not that exciting as every IDE is faster here but they may be used to create basic entry points for more complex queries or to create constraints for validation our architectures. Queries may be joined using WITH, UNION and other operators. Besides from analyzing classes and their relations we may also explore other labels and pieces of information that is written to our graph database by the different plugins. The following query creates a list of Jar-file artifacts from our sample-project and produces an output in the format “groupid:artifactid:version“. I have changed the look of the graph view by giving nodes labeled as projects a red background and increasing their size. Sometimes it’s more practical to store our analysis data rather in some remote Neo4j server than in a local store. 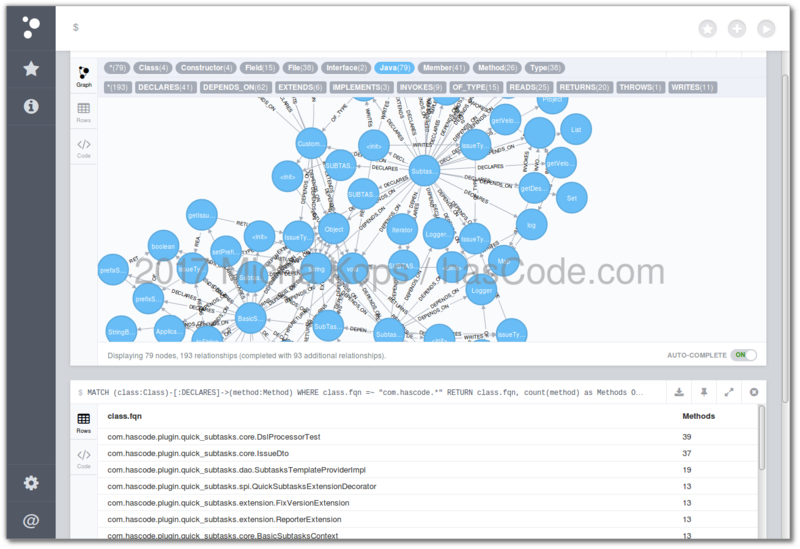 As there is an official Neo4j Docker image on DockerHub, it’s really easy to demonstrate the analysis process using a Docker image. Afterwards when the server is running, we need to reset the credentials for the user neo4j once using the web admin panel at http://localhost:7474. [INFO] Reset finished (removed 0 nodes, 0 relations). [INFO] Closing store in directory 'bolt://localhost:7687'. 2018-02-19: Metrics for package abstractness added, comments activated. 2018-01-28: Examples for remote Neo4j server and Docker added. This entry was posted on Sunday, December 31st, 2017 at 3:39 pm	and is filed under Uncategorized. You can follow any responses to this entry through the RSS 2.0 feed. You can skip to the end and leave a response. Pinging is currently not allowed.